Tribal Trails Books & Resources is a department of Northern Canada Evangelical Mission (NCEM) and exists to further the Gospel of Jesus Christ among Canada’s First Peoples. 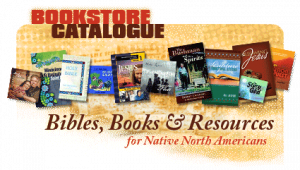 Our catalogue is published to help provide Christian materials for Native people, as well as related ministry tools. Unless otherwise noted, material is in the English language. Materials in several Native languages are listed in the Native Language section. If you would like a printed copy of our Catalogue, please call or write us (contact numbers on “How to Order” page) … or you may download a “pdf” copy of our Catalogue by clicking here or below. Wondering how to order? Hopefully you will find everything you need to know on our How to Order page. We’ve organized our products into the categories shown at right. If there’s something you can’t find, please don’t hesitate to Contact Us. We do not have a physical “bookstore” set up for browsing. All of our orders are received by phone, mail, or email (sorry, we are not set up as an online store … not yet, but hopefully soon). If you want to avoid shipping charges, you can pick up your order at NCEM Headquarters on the Shellbrook Highway, 8 kms west of Prince Albert. Our hours are: 9:00 am to 4:30 pm (Mon. – Fri.).